I bet you thought you’d get away with a normal Shabbat this week – no second scroll, no extra psalms – since the holidays are over (we’ll take down the sukkah on Sunday, really). Ha! This Shabbat is also Rosh Hodesh (guttural “h” for which I sometimes use “ch” or just don’t bother) Cheshvan, the first day of the month of Cheshvan, so we have a second scroll reading (sacrifices, of course) and several extra psalms. BTW, regarding Cheshvan and Marcheshvan, see last year’s comments. However, we are indeed back in the normal annual cycle of Torah readings. 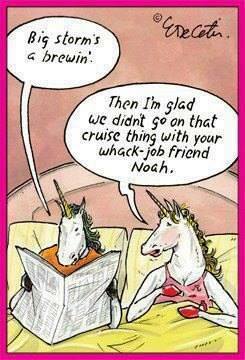 This week: Noah (guttural “h,” etc.). Contents: The Lord is fed up with human corruption and decides to start over via a flood. 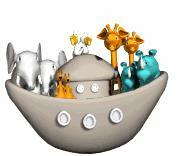 One at least half-way decent man, Noah, is chosen to build an ark to save his family and the animals (pairs for eventual breeding, additional sets for sacrifices). After the flood, the Lord makes a covenant with Noah, promises never to destroy all people and animals – at least with a flood – and uses a rainbow as a sign of the agreement. Noah then discovers wine and gets drunk, not a hopeful indicator of improved human behavior. 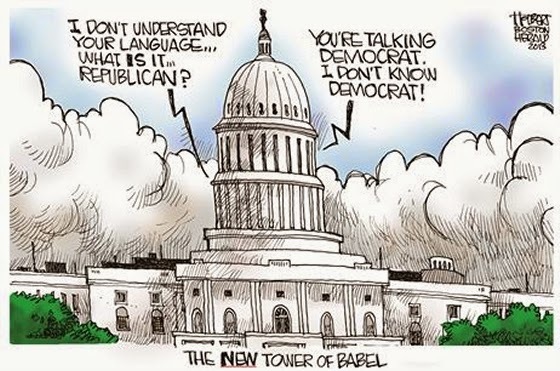 Eventually, humans have the effrontery to try to build a tower to heaven, a task thwarted by the divine imposition of speaking in different languages, so the Tower of Babel is not built. Finally, we read a list of Noah’s descendants, including Abram, whose story gets underway next week. What people generally recall of this story is first, the ark, and then, the ark per se not being especially interesting, the animals. This portion signals a change in the human/animal relationship. As I noted last year, where Adam was commanded to live in harmony with the animals, he and they being vegetarians, Noah is told the animals will now fear humans, who can now eat them. I was not much of an animal person as a child, my pets confined to an occasional short-lived goldfish. However, once we had two kids (children, not goats), that changed to the extent that at one point we had two cats, two gerbils, two goldfish, and, briefly, one hermit crab. Now we have one cat (she doesn’t do well with other cats). 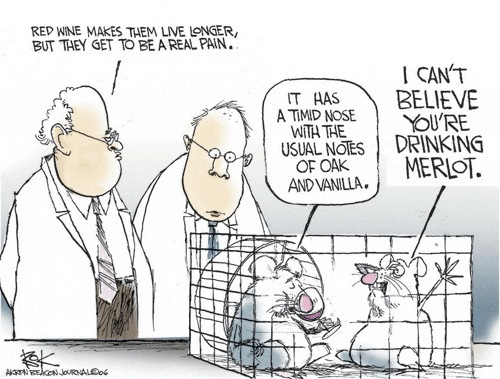 Human/animal interactions are complicated. Is the human really the master? How much do we train our pets, and how much do they train us? To what extent do we, or can we, or should we, try to make a pet over in our own image? This is a particularly thorny question in the wild. I recently saw a series on PBS called “My Wild Affair,” whose episodes, described below, illustrated the intricate interactions between humans and wild baby animals, at least three of which had been orphaned and would have died without the human intervention. As usual, my remarks are in brackets and italics. The story of Aisha, the baby elephant orphan, and Daphne Sheldrick, the woman who became her human foster parent [in Kenya]. Their intense bond reaches a crisis point when Daphne leaves Aisha with a babysitter for a few days [a week] to attend her daughter’s wedding [in Nairobi]. Aisha believes she has lost Daphne for good and refuses to eat, leading to her death [at 6 months of age, hours after Daphne’s return, her head in Daphne’s lap]. Heartbroken, Daphne uses the lessons learned from Aisha’s short life [e.g., make sure an orphan bonds strongly with a whole family] to help her save more than 150 orphans over the next 40 years. The true story of Andre, a two-day-old wild harbor seal who, in 1961, was rescued from certain death by Harry Goodridge, an arborist from Rockport, Maine. Over the next 25 years, Andre and Harry established a friendship that brought Andre into the world of humans without Andre’s ever having to sacrifice his wildness. The human world gave Andre shelter during the harsh New England winter, but staying wild at heart meant Andre had the know-how to make the 200-mile swim home to Rockport. This interspecies friendship weathered every kind of challenge, including, at the end, Andre’s blindness. Each of these stories affected me strongly. Aisha’s death from grief was heartbreaking, especially since her human family had planned properly how they would return her to the wild when she was old enough. Rupert died because his human family did not know how to return him to the wild and did so too abruptly when he became too grown to be a pet. Chantak’s story made me especially angry. The researchers blithely treated him like a human child (including junk food) and neglected to recognize the problems he might cause when fully grown (up to 300 lb, 8 ft. arm span) or plan what to do with him. He became a misfit, caught between humans and apes, reminding me of the protagonist in Eugene O’Neill’s play, “The Hairy Ape.” Only in the case of Andre the seal were the human and the animal in tune with each other. Andre enjoyed his time with humans, but was allowed to retain his wildness. Not surprisingly, he lived a happy, full lifetime and died peacefully in the wild, on the way back to Rockport. Nope, this time I want 20 decks. 20! That’s huge. OK, kitted out for the animals as usual? No, this time it’s for fish. FISH! OK, you’re the boss. I’ll get the whole selection, cod, haddock, skate. .
Just the one type? Carp. OK, says Noah, but can I just ask why? I just fancied a multi-story carp ark! DAY 771 – There was some sort of gathering of their accomplices. I was placed in solitary throughout the event. However, I could hear the noise and smell the foul odor of the glass tubes they call “beer.” More importantly I overheard that my confinement was due to MY power of “allergies.” Must learn what this is and how to use it to my advantage…. DAY 774 – I am convinced the other captives are flunkies and maybe snitches. The dog is routinely released and seems more than happy to return. He is obviously a half-wit. The Bird, on the other hand, has got to be an informant. He has mastered their frightful tongue (something akin to mole speak) and speaks with them regularly. I am certain he reports my every move. Due to his current placement in the metal room his safety is assured. But I can wait, it is only a matter of time. This entry was posted in Uncategorized and tagged Aisha the elephant, Andre the seal, animals, ark, Chantak the orangutan, flood, Genesis, language, Noah, pets, rainbow, Rupert the rhino, Tower of Babel, wine. Bookmark the permalink.